are 24-volt DC powered with manual travel available with roll v-pans, and roll posts. Standard features include a step-down foot floor lock for enhanced safety, safety yellow powder coating, and ergonomic casters for maximum mobility. are 24-volt DC powered lift, clamp and rotation with manual travel. Our roll manipulators are available with an array of clamp rotators designed to handle a wide range of roll diameters. Popular options include scales for weighing and FDA approved epoxy powder coating for use in food and pharmaceutical applications. Our roll manipulators can accommodate rolls up to 500 lbs. and are also available in AC and air-powered models as well. are 24-volt DC powered lift, clamp and rotation with manual travel. Our roll manipulators are available with an array of clamp rotators designed to handle a wide range of roll diameters. Popular options include scales for weighing and FDA approved epoxy powder coating for use in food and pharmaceutical applications. Our roll manipulators can accommodate rolls up to 1500 lbs. and are also available in AC and air-powered models as well. with 28.5" width counter balanced frames are capable of continuous use for 16 hours between charges. Roll-Haulers are available with single or two stage masts for elevations up to 144", with an array of side rotating clamps to handle a wide variety of roll diameters. Popular options include scales for weighing, FDA approved epoxy powder coating for use in food and pharmaceutical applications and FM Global approved "EE" rating for use in hazardous areas. Other features include variable speed thumb controls, user-friendly lifting and lower controls, and AC drive motor with regenerative braking. for handling rolls up to 52" in diameter with weight capacities up to 2000 lb/ 907 kg. The RCR20 requires no hydraulic or electrical connections to the lift truck or straddle stacker. Other features include a positive locking gearbox that prevents drifting and a control box cord equipped with quick disconnect. for transporting rolls from 52” to 40” in diameter, up to 48” wide, weighing as much as 4000 lb. Rolls are secured by a removable safety bar to contain the rolls while in transport. Roll Handling Equipment is frequently to handle rolls of material including paper, film, foil, textile and nonwovens. These materials are commonly found in the print and packaging industries. For instance paper roll handling equipment is commonly used in the paper industry to lift and transport paper rolls to printing machines and throughout the manufacturing and distribution process. 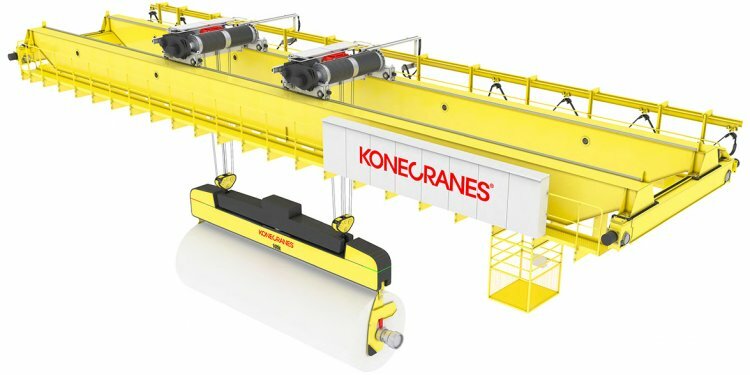 Self Powered Roll Clamp Rotator Model RCR20 CLAMPS AND ROTATES ROLLS MATERIALS 360 DEGREES If you'd like to learn more about our roll handling equipment feel free to contact us today.